Education plays an essential role in nation building for schools serve as a second home for many students to grow and develop. In these schools, teachers all over the country educate the youth through years of constant guidance and supervision. It is a noble, but at the same time, a challenging profession for it is an important responsibility to undertake day-in and day-out. Despite the large allocation of Education in the national budget, the compensation of public school teachers have remained low and borderline insufficient, compelling most teachers to find other means to generate income. With the rising price of goods and the increasing cost of living in the country, teachers and other school personnel cannot rely solely on their modest salaries, instead, they turn to loan agents in order to make ends meet. It is the policy of the State to promote the welfare and economic well-being of teachers and personnel in the education sector. They should be given the proper compensation for serving in the front lines. Their profession as educators is an integral part in the development of the whole nation. This measure seeks to provide additional support and compensation for teachers and personnel in Basic Education. SEC. 2. Declaration of Policy. 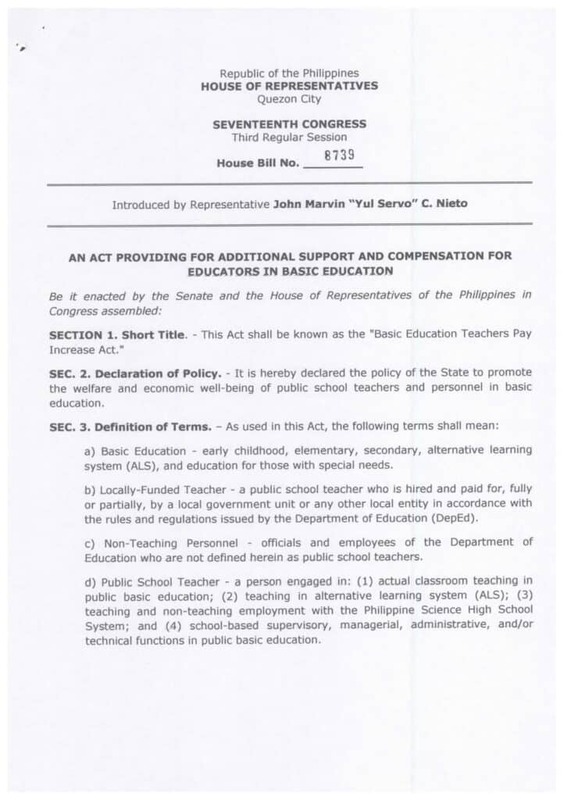 – It is hereby declared the policy of the State to promote the welfare and economic well-being of public school teachers and personnel in basic education. a) Basic Education – early childhood, elementary, secondary, alternative learning system (ALS), and education for those with special needs. b) Locally-Funded Teacher – a public school teacher who is hired and paid for, fully or partially, by a local government unit or any other local entity in accordance with the rules and regulations issued by the Department of Education (DepEd). c) Non-Teaching Personnel – officials and employees of the Department of Education who are not defined herein as public school teachers. d) Public School Teacher – a person engaged in: (1) actual classroom teaching in public basic education; (2) teaching in alternative learning system (ALS); (3) teaching and non-teaching employment with the Philippine Science High School System; and (4) school-based supervisory, managerial, administrative, and/or technical functions in public basic education. SEC. 4. Beneficiaries. – The Additional Support and Compensation provided for in this Act shall cover the following: public school teachers, locally-funded teachers, Philippine Science High School System teaching and non-teaching personnel, and non-teaching personnel of the DepEd, excluding those occupying positions from salary grade level 30, under the DepEd schedule of salaries, and/or Assistant Secretary upwards. Provided further, That in succeeding years, said support compensation shall be continuously paid in full to the beneficiaries. Provided furthermore, That said additional compensation shall be considered as part of the basic salary for the purpose of computing retirement pays and bonuses that the beneficiaries under this Act are entitled to. Provided finally, That the support granted under this Act shall be without prejudice to future increases in the basic pay of the herein beneficiaries. a) Support in the form of allowances and other remuneration funded from local school board funds. – Any law, executive issuance, department order, local ordinance, and the like, to the contrary notwithstanding, the Local School Boards, as defined in the 1991 Local Government Code, are hereby authorized to augment the existing allowances of herein beneficiaries to be sourced from the Special Education Fund (SEF): Provided, That the implementation of this authority shall not in any way prejudice the required budgetary allocation to address the school building and classroom shortage in the area. b) Medical Allowance. – The herein beneficiaries shall receive an allowance for medical check-up in the amount of One Thousand Pesos (Php 1,000.00) per year. c) Magna Carta Bonus. – In consideration of the many unenjoyed and unimplemented provisions of Republic Act 4670 or the Magna Carta for Public School Teachers of 1966, the DepEd is hereby authorized to grant an annual Magna Carta bonus to public school teachers and non-teaching personnel of the DepEd. The maximum amount of the Magna Carta bonus shall be equivalent to the entitlement a teacher or a non-teaching personnel should have received under Republic Act No. 4670 but which has not been realized in a given budget year. Congress shall appropriate the funding for this bonus upon the recommendation of the DepEd. SEC. 7. Appropriation. – The amount necessary to carry out the initial implementation of this Act shall be sourced from the current budget of the DepEd. Thereafter, such sum as maybe necessary for the continued implementation of this act shall be in the annual General Appropriations Act (GAA). SEC. 8. Transitory Provision. – Notwithstanding Section 3 (b) of this Act, all locally-funded teachers shall enjoy the benefits herein granted: Provided, That within three (3) years from the approval of this Act, locally-funded teachers who fail to comply with said Section 3 (b) shall cease to be covered by this Act. SEC. 9. Implementing Rules and Regulations. – Within sixty (60) days from the effectivity of this Act the DepEd shall promulgate the necessary rules and regulations for the effective implementation of this Act. SEC. 10. Separability Clause. – Should any provision herein be declared unconstitutional, the same shall not affect the validity of the other provisions of this Act. SEC. 11. Repealing Clause. – All laws, decrees, orders, rules, and regulations or other issuances or parts inconsistent with the provisions of this Act are hereby repealed or modified accordingly. SEC. 12. Effectivity. – This Act shall take effect fifteen (15) days after its publication in the Official Gazette or in any two (2) newspapers of general circulation in the Philippines. PRINCIPAL AUTHOR/S: NIETO, JOHN MARVIN “YUL SERVO” C.